You have an opportunity to experience a half-day workshop in Bellevue, Washington, covering 7 steps to marketing success by a best-selling author and business coach. And, because you are following me, ten (10) of you will receive admission absolutely FREE. Here’s the details. Thursday, April 29th, 2010, 9am-12pm. John Jantsch is a marketing and digital technology coach, award winning social media publisher and author of “Duct Tape Marketing – The World’s Most Practical Small Business Marketing Guide”. His Duct Tape Marketing Blog was chosen as a Forbes favorite for small business and marketing. You can view segments of a presentation on social media given at the 2010 Consumer Electronics Show in Las Vegas, NV for American Express OPENForum by John. He really gets it and I follow him because he does. He teaches about “No Social Media Without A Strategy”. You can register for his Bellevue appearance at this link. 7 Steps To Marketing Success and use “thatsalesguy” in the discount code box to get 20% off the ticket price. Or, complete the form below to receive admission absolutely FREE, IF you are one of the first 10 readers to do so. UPDATE 4/19/10, 11:30PM – The 10 Free tickets have been awarded! You can still Submit this form to join my list and receive future advance bonus offers for events like this. Isn’t it great to have friends. I thank Glenn Froehlich, That Over 40 Social Media Guy, and your local Authorized Duct Tape Marketing Coach for his generosity to my readers and members of Entrepreneurial Junkies. This entry was posted in Internet Marketing, Marketing and Advertising, Observations and tagged Marketing, workshop. Bookmark the permalink. 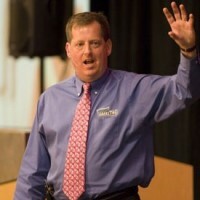 John is a dynamic speaker and presenter. His material is top notch and his intimate knowledge of the content is obvious from the moment he opens his mouth. I hope that I get to be one of the first to apply for one of your free tickets. I may be a local search and seo professional and author on the topic but in this rapidly shifting market I am always eager to learn more! So Howard…here is my shameless bit of self promotion…Pick Me! Pick Me! Regardless of who are the first ten to get their hands on these babies…they will learn a ton at any Duct Tape Marketing event. Thank you for the generous offer. I will take you up on it.